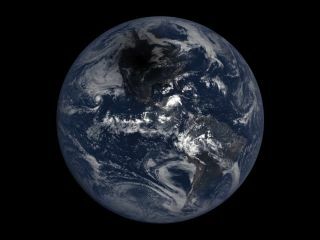 NASA's EPIC camera on NOAA's DSCOVR satellite snapped this view of the total solar eclipse crossing (the very round) Earth on Aug. 21, 2017. B.o.B may be about to blow the lid off the "round-Earth conspiracy." Unlike the rest of us, the Atlanta-based rapper has not been "tricked" into believing our planet is spherical by thousands of satellite photos, the shape of Earth's shadow on the moon during lunar eclipses, the circumnavigation of the globe, the physics of planet formation or any other such evidence. All that being said, however, B.o.B appears to be keeping an open mind. In fact, he wants to gather some crucial evidence about Earth's shape himself — with the aid of $1 million, which he's trying to raise via the crowdfunding site gofundme.com. "What's up guys! Help support B.o.B purchase and launch one, if not multiple, satellites into space," the project description states. "He's donated 1k to the cause to get it going, and will be keeping you updated with step-by-step documentation of the process! Help B.o.B find the curve!" As of Wednesday morning (Sept. 27) — five days into the campaign — B.o.B had raised about $1,700 on top of his initial $1,000 contribution. But he had to know this would be a long and difficult road; the round-Earth conspiracy runs deep, going all the way back to the observations and deductions of the ancient Greeks.